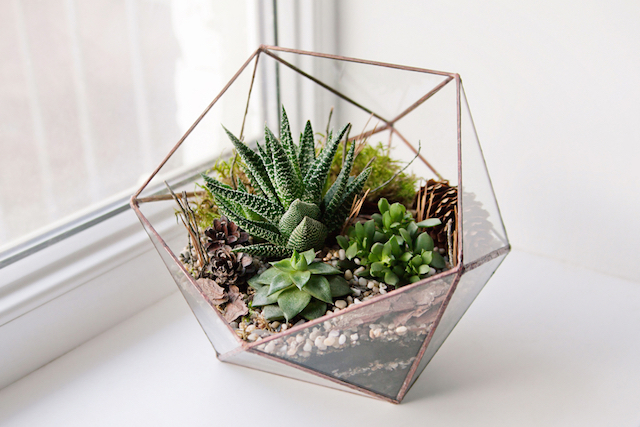 Spruce up your space with succulents--they're good for you! Did you know that houseplants have tons of beneficial qualities? Succulents, the latest in plant trends, have become increasingly popular recently. Not only are they super cute, they have quite a few health benefits and can be planted in practically anything, too. According to a study from Norway's University of Agriculture, plants significantly improve quality of air. The plants help to increase the humidity levels in your home, which decreases dust levels and keeps you healthy. The study also found that people with indoor plants displayed 30 percent less cold symptoms than those without plants. Plants can help your mental well-being, too. The American Horticultural Therapy Association found several psychological benefits including reduced stress, anxiety and depression from owning plants. They also found a boost in self-esteem and overall mood in plant owners. And if you're struggling to focus, owning a plant may be a good idea, because Texas A&M University discovered that people who keep plants around them show enhanced concentration, memory, attention and creativity. What is your favorite kind of plant? Tell us in the comments!